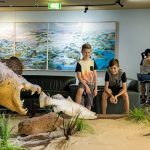 The Mercure Kakadu Crocodile Hotel in Jabiru – or ‘The Croc’ as it is known locally – is celebrating its 30th anniversary in October and has designed a number of packages for lovers of the outback to celebrate the anniversary in style. The anniversary will involve a gala dinner on 26 October, with dinner and accommodation packages released for the event. Often said to be “the only croc you want to end up inside”, the hotel’s unique design was selected because of the crocodile’s cultural significance to Kakadu’s Gagudju people and the great respect the crocodile commands in their past and present lives. Ginga, the giant crocodile, is a spirit ancestor of the Gagudju people. Located in the township of Jabiru, The Croc’s debut in 1988 opened up the World Heritage listed Kakadu National Park to modern tourism, with the hotel launch building on the success of Crocodile Dundee (1986), which helped put Kakadu and its crocodiles on the international tourist map. 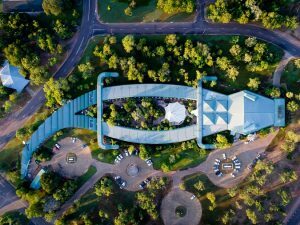 The hotel is built as a 250-metre long, 30-metre wide giant crocodile. The circular parking areas represent crocodile eggs; the hotel entrance is its gaping jaws with menacing teeth. Ventilation units are housed within the crocodile’s slatted yellow eyes, which glow red at night. The head section of the hotel incorporates reception, an expansive marble foyer – a cool green oasis – the Escarpment Restaurant and Bar, gift shop, internet kiosk and the renowned Ochre Aboriginal art gallery. While celebrating the past, the 30th anniversary event will be the perfect opportunity for visitors to explore Kakadu, taste some of the Territory’s best-known staples and be entertained with great Territory music. · Gala Dinner and a Kakadu Weekend accommodation package: inclusive of two nights’ accommodation (26 and 27 October), Gala Dinner tickets, (including canapes and welcome drinks, a five-course degustation menu, premium drinks package, live entertainment), buffet breakfast on both mornings, and a 1½ hour Yellow Water Cruise on 27 October – $849.00 for two people (double/twin share), $549 for one person (single). The Croc has been a champion of Indigenous art over the past three decades, with Kakadu artists working onsite to create works of art for sale in the Ochre Gallery.Over the 30th anniversary weekend, the gallery will offer 30% off artworks so that guests can take authentic Kakadu art back home with them. Fully indigenous-owned, the Mercure Kakadu Crocodile Hotel is part of the Kakadu Tourism group and is managed by Australia’s largest hotel group, AccorHotels.